Stop in for your auto repairs and auto tune ups! Are you looking for an auto repairs shop in Titusville or Cocoa, FL? For the finest in auto A/C repair and auto tune-ups choose the professionals at Jobe's Automotive. We look forward to serving you. Back in 1981 Jerry Jobe Sr. founded Jobe's Auto Air. Since then the business has expanded to include Jobe's Auto Service. Today the business is still family owned and operated - AND - our motto is still the same - "Customer Satisfaction Guaranteed". Whether you need the best auto A/C repair guys in town or just simple auto tune-ups, we're the ones to call. Ask us for a quote on any auto repairs or work you need done. And as always our prices are firm for 60 days. Our reputation in auto repairs are humble, honest and as the most trusted auto repair shop in the Titusville, Cocoa, FL and all of the Brevard County area came from hard work and the ability to provide personalized service every day, every year we’ve been in business. We're here to satisfy you. 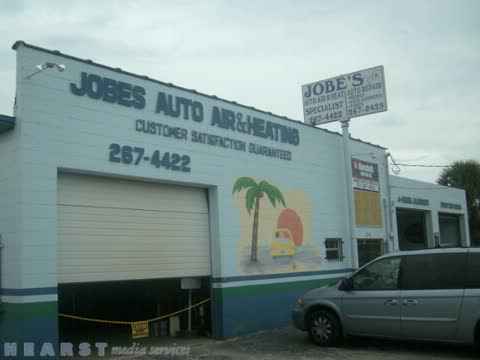 And remember, at Jobe's Auto Air and Jobe's Auto Service, customer satisfaction is guaranteed. Today, as we drive our automobiles, a great many of us, can enjoy the same comfort levels that we are accustomed to at home and at work. With the push of a button or the slide of a lever, we make the seamless transition from heating to cooling and back again without ever wondering how this change occurs. That is, unless something goes awry. When that happens - think of us. We are the best auto A/C repair guys in the Titusville, FL and Cocoa, FL and Brevard County area! Today, most cars are controlled by computers. The fuel injectors, the spark plugs, the steering system and more are all told when to fire and when to move by an onboard computer system. If something’s going wrong with your car or engine, the onboard computer can tell us. Most auto repairs are simple when you catch them early. Regular maintenance of your car is like health insurance for your transportation. Your vehicles need regular maintenance to retain their safety, dependability, performance, fuel economy, and emission control capabilities. An auto tune-up is needed regularly to keep your automobile from unnecessary repairs. Let Our Skilled Mechanics Take Care of Your Auto Tune-Ups, Brake Repair, & More! Auto tune-ups are done to your car to replace and maintain parts that wear out through usage. Tune ups will ensure that your car will continue to run smoothly, continue getting its normal gas mileage and prevent severe damage the engine and other major components. At Jobe's Automotive, we provide the auto tune-ups and auto repairs you need and provide for the Cocoa, FL; Titusville, FL; and the surrounding areas. At Diamond Discount Automotive Service & Tire, we’ll never sell you a packaged brake job. We only fix what you need fixed on a part by part basis so you don’t pay for anything that’s not right for you or your vehicle. All brake repairs and brake shops are not the same, as we provide cost-effective solutions that are just as important as a stellar service. So call us today to easily schedule a brake repair service in the Waltham, MA area. Your car’s belts make more than 35 million revolutions each year, so don't ignore them. An important part of your car, the belts wrap around pulleys to power many of your car’s other components. Worn, defective or improperly adjusted belts contribute to accidents and breakdowns, costly repairs, battery failure and overheated engines. Automatic transmission fluid lubricates cools and cleans internal components of the transmission. It also helps to maintain the hydraulic pressure necessary for the transmission to function. The additives in the transmission fluid can be depleted over time. Proper alignment of your vehicles front end is critical to the proper wear of your tires and more importantly your safety. An improperly aligned front end will cost you far more in new tires or an accident from the loss of control of your vehicle. Ask us to check your front end to be both safe and secure. If you are looking for auto repairs, auto A/C repair or auto tune-ups in Titusville, FL or Cocoa, FL or all of Brevard County area by an honest and trustworthy company, then choose Jobe's Automotive. We have been providing quality and professional services to the area since 1981. WE WILL KEEP YOU COOL IN THE SUMMER AND WARM IN THE WINTER HERE IN TITUSVILLE, COCOA, AND ALL OF BREVARD COUNTY. Serving all areas of Brevard County! Full service automotive repairs including: Air conditioning (A/C) & heater repairs, Tune ups, All preventative maintenance, Oil & filter change, Computerized wheel alignment, Brake service, Brake repairs tire replacement, Leak repairs, Chassis repairs, Lubrication services, Battery replacement, Ignition/starter repairs. We provide a written estimate that is good for 60 days – we guarantee it.